There are a number of way cool shows at local galleries right now. If you, like me, missed some of the openings, there’s still time to catch a view. It’s well worth the visit. 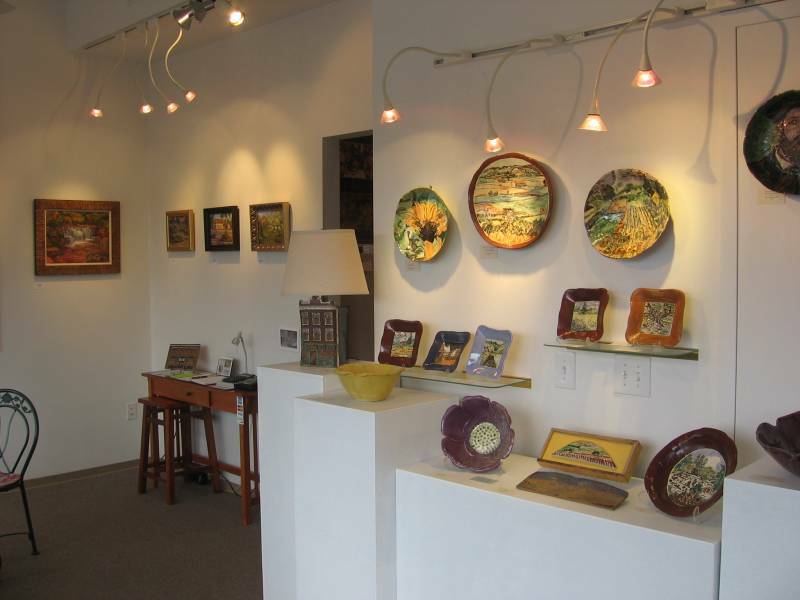 ArtOnWater Gallery features the work of Mark Daehlin and Ingrid Bjerstedt Rogers, oil paint and illustrated pottery respectively in a show called “Impressions”. Located on the west bank of downtown at 217 South Water Street, the gallery is open Wednesday through Saturday from 3 to 8 p.m., with the popular ChARTdonnay Thursdays, with wine and cheese, from 5 to 9 p.m.
Just across the pedestrian bridge over the Cannon River, the Northfield Arts Guild has “Wind, Water and Light”, with photographs by Megan Longtine-Jones and paintings by Joonja Lee Morners, as well as a member show by Julie Free Heart. The Arts Guild Gallery, at 304 Division Street, is open Monday through Saturday, 10 a.m. to 5 p.m., and open late until eight on Thursdays. Up on the western hill, it’s “Science, Art and the Imagination”, at the Flaten Art Museum on the St. Olaf College campus. Featuring featuring book art by Daniel Kelm, photography by Amanda Means, painting by Merrill Steiger and video by Susan Woods, the show can be seen Monday through Friday from 10 a.m to 5 p.m., open ’til eight on Thursday and from 2 to 5 p.m. on Saturday and Sunday. On the eastern hill, the Carleton College Art Gallery is showing “World Ceramics: Transforming Women’s Traditions“, featuring ceramics and ceramicists from around globe. The gallery is open from 12 to 6 p.m. Monday through Wednesday, 12 to 10 p.m. on Thursday and Friday, and 12 to 4 p.m. on Saturday and Sunday. So make a little time to check out a bit of visual art. As I said before, it’s well worth the visit.